Supragenix releases it's CB-1 Weight Gainer commercial this week that will show on television sets across the nation and spread their message that there is a safe and effective weight gain pill to help you gain weight fast. 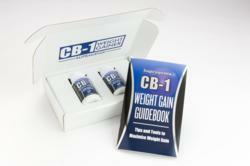 Tens of thousands of people have successfully gained weight with CB-1 Weight Gainer and word continues to spread about the success of this amazing weight gain supplement. We’re excited for this commercial to spread the word that there is there is a product that helps people effectively gain weight. Supragenix will release its very first CB-1 Weight Gainer commercial this week. The two minute commercial will show across America and expand the company’s message that their weight gain pill is a safe solution for being too skinny and an effective way to gain weight fast.